A shark’s habitat can reduce its sensitivity to rising CO2 levels, according to Australian scientists. “As part of the study we exposed the sharks to increased CO2 for more than two months, mirroring the levels predicted for the end of the century,” says study co-author Dr Jodie Rummer from Coral CoE. The researchers found the sharks were regulating their systems to counter the higher levels of acid in their bodies. Importantly, Dr Rummer explains, the sharks’ ability to cope with low oxygen levels – similar to that found in its natural habitat – was unaffected by high CO2 levels. Study co-author, Professor Philip Munday from the Coral CoE says the sharks’ physiological adaptations, which enables it to cope with the conditions within reefs, makes them better able to tolerate ocean acidification. 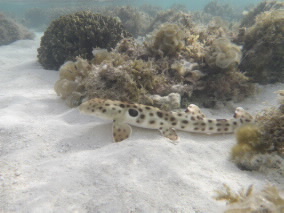 A product of its environment: The epaulette shark (Hemiscyllium) exhibits physiological tolerance to elevated environmental CO 2 by Dennis D.U Heinrich, Jodie Rummer, Andrea J. Morash, Sue-Ann Watson, Colin A. Simpfendorfer, Michelle R Heupel and Philip L. Munday is published in the journal Conservation Physiology. Epaulette shark underwater – image credit: M.Heupel.